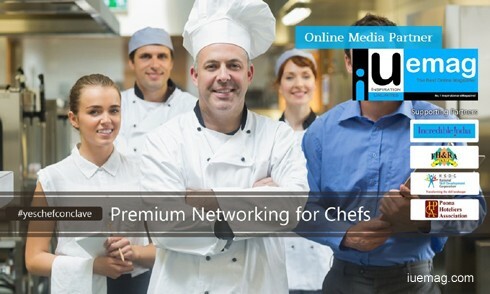 Stirring up a perfect recipe of learning, networking and business connect. Exito Media Concepts Pvt. Ltd. is happy to announce its new event dedicated to diverse the culinary landscape in India. The YES CHEF CONCLAVE 2017 will take place on the 11th and the 12th of April, In Mumbai. The conference aims to bring 200 senior chefs from various 3-5 star properties, Heritage hotels and fine dining restaurants from all over India. Supported by Incredible India , National Skill Development Corporation and Federation of Hotels and Restaurants Association India the event will address the latest trends and challenges in the fast evolving culinary landscape of India. The agenda comprises of various keynotes, panel discussions and ignite talks presented by the industry leaders who have already contributed a lot in the industry. Few notable names include Chef Vicky Ratnani Celebrity chef and culinary director – everstone capital, Chef Salil Fadnis - Executive Chef - Hotel Sahara Star and Aamby valley city, Chef Sanjay Malkani - Head of production – Blue Foods, Chef Surjan Singh Jolly - Director of F&B JW Marriott, Rahul Akerkar a famous chef turned entrepreneur known for one of the first fine dining concepts in Mumbai called Indigo, Chef Saby Gorai, Chef Nitin Tandon, Chef Shaun Kenworthy and many more. The topics of discussion revolve around the challenges faced by a head chef of a property including new gastronomy concepts gaining traction locally, Integrating technology with kitchen operations of the likes of IoT, how chefs can leverage social media for better business, the increasing bend towards medicinal foods, How to develop new business models, Government support to FnB industry 2017 and beyond and many more. Exito is known for conducting bespoke events where a lot is decided by the attendees, be it the content or be it the people and network exchange. Having successfully conducted many conferences in the IT, BFSI and Finance domains, Exito sees most of its properties in the 7th – 8th editions. The Indian Culinary Industry sees a few events but in exhibition formats or very specific regional chapters. This is the first attempt to bring senior chefs who share the same principals and emotions about the industry, together under one roof for two days. We hope to contribute to the industry , owing to the way it has contributed in our lifestyles. Says Rishikesh Shetty, MD Exito PVT. Ltd. The iUeMagazine team is delighted to work with YES CHEF CONCLAVE 2017 as Official Online Media Partners & is expected to bring Unlimited Inspiration for all readers from the proceedings of this event. Staying tuned to the enriching updates from this event is recommended.